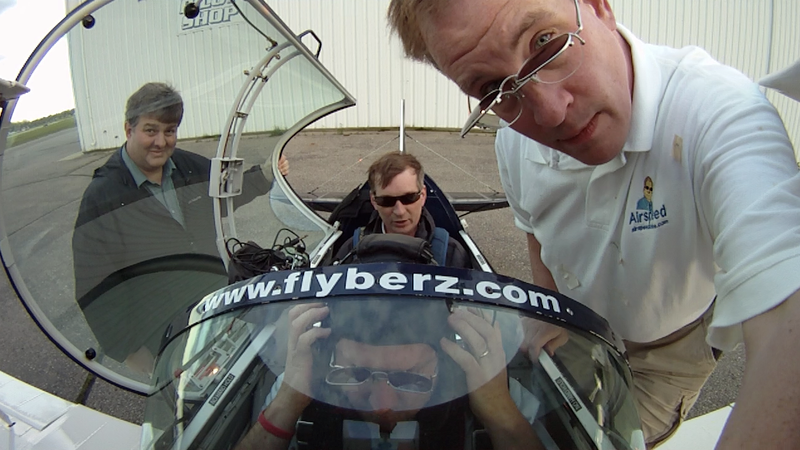 I spent a little time today cataloging video and audio from Friday 14 May, the first full day of flying at Acro Camp. I got through all of the non-Panasonic footage and about half the audio. Fortunately, I’m finding that the various Out of 20 video sequences, something like eight are mated up with their sister sequences from the same flight. And I have the audio mated up with several sequences as well. I sure wish that I had used a clacker board for a lot of these, but it turns out that it’s not going to be as hard as I thought it would be. I went through some of the footage from David Allen’s ride with Don Weaver that evening and it got me really lonely for the Acro Camp experience. I e-mailed Dave the frame grab above. He e-mailed me back saying that we could probably get away with shooting the next one without actually having the first one on the can. And then went on to suggest that some folks would show up for subsequent Acro Camps regardless of whether there was a movie attached. Ever wonder why people gravitate to Dave? That’s just one of the many reasons. That Friday probably had the best light of any day at Acro Camp. The frame grab of Michelle Kole and Don Weaver above is an artifact of that. Just gorgeous sunshine and even some high cirrus and low scattered to serve as a background. Next, it’s the panasonic footage from the 14th. Hoping to have that done this coming week and then I can move on the cataloging the subsequent days of airborne footage. Once that happens, I’ll be able to stick it all in multiclips and really sit down to watch it all. This is the scut work phase. It only gets cooler from here.